welcome back to the 12 Days of Christmas Day 7. Today I have a card to show off that features a variety of colouring techniques - watercolour and copic markers! I love penguins and I always have to use them on at least one Christmas card each season. I love the new here we go a-waddling stamp set( LWN | SSS ) by Lawn Fawn. Thank you to Lawn Fawn for sponsoring today's $25 giveaway! I used my Sakura Koi Watercolours (30) XNCW30N( SSS | AMZUS ) to create this background. I got a really beautiful shimmer as well using the Zig Kuretake Gansai Tambi STARRY COLORS Set of 6 ( SSS | AMZUS ). This is the same palette I used the other day on the galaxy cards! I die cut various elements from the here we go a-waddling stamp set( LWN | SSS ) with here we go a-waddling coordinating dies( LWN | SSS ) and carefully placed my scene. Once the background was dry, I was able to add in my embossed sentiment. Thank you Lawn Fawn for sponsoring today's giveaway! These penguins are so cute!!!! Love this stamps set the penguins are so cute. Really cute card!!!!!! Love this card, the penguins are adorable!! Penguins are the best!! Love your background technique. Super cute card! Love the penquins and your shimmery background is perfect for them! This is one of my favorite sets this year from LF. Your card is adorable! OMG Justine Your Card is Positively Adorable. Your Background is so Gorgeous and your little scene is as cute as can be. Outstanding Coloring job!! Your card is Spectacular. Thanks for the chance for a Most Generous Giveaway!! YOU so ROCK!! I love the water coloring and the penguins turned out so stinking cute. Love that stamp set. Thanks Justine. Beautiful card! Love the watercolor background! You've inspired me to try watercolors! I love how you use the shimmering watercolors over the regular watercolors. You create beautiful cards! The water coloured background is great. I love Lawn Fawn. Their products are always so cute! I have never thought to combine Watercolor and Copics...An genius idea! So So Cute! Beautiful background and the little penguins are adorable. Sweet card! Love those adorable carolers! Very cute card! 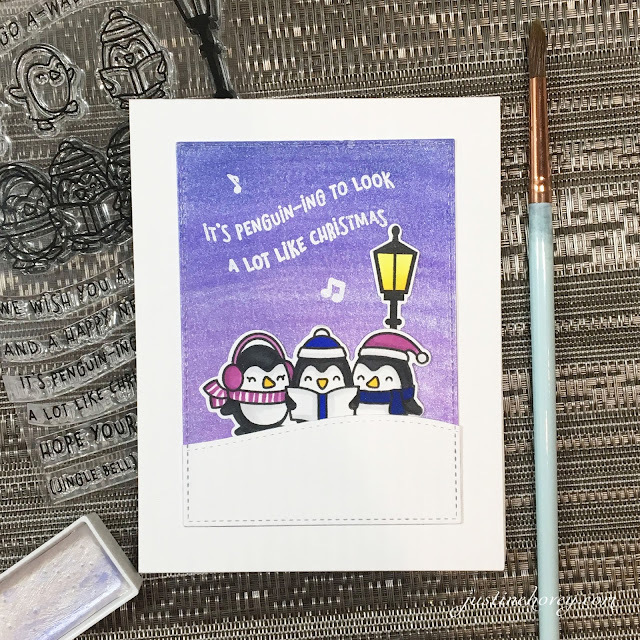 I love the little penguin carolers and the beautiful watercolor sky. Thanks for sharing! this watercoloring - love it. Love LF's stamps and dies. So glad to see you make a card with these cute penguins. I need to play around with water color backgrounds more. It looks fun. Great card,TFS! Such cute penguins. I have loved LF since the very beginning.....They always come up with adorable images. I love lawn fawn products. I only have one of their stamp sets. Try to watch for sales. Your cards are amazing and videos are fun to watch. Love this penguin set. Your card is so lovely; great sky! I really like your background on this card! Thanks for sharing. Love This Justine!!! The background us just beautiful!! Love that purple background and the penguins are so adorable! What a fun and pretty card!!! This is such a fun and simple card Justine. I love LF's products anyway but these penguins are SO sweet out caroling in the snow and I love the street light in the background, super cute! Super cute card today! Can’t wait to try this background, super easy and very pretty! Cute penguins! And I love your background! I love this card with the cute little penguins! These penguins are so adorable! I have Lawn Fawn's "TOBOGGAN TOGETHER" from last year! I love them!! I need to play more with water colors as mine just look like mud, lol! I LOVE the look of your sky!!! I love this card! The background is beautiful! Love the watercolor background! 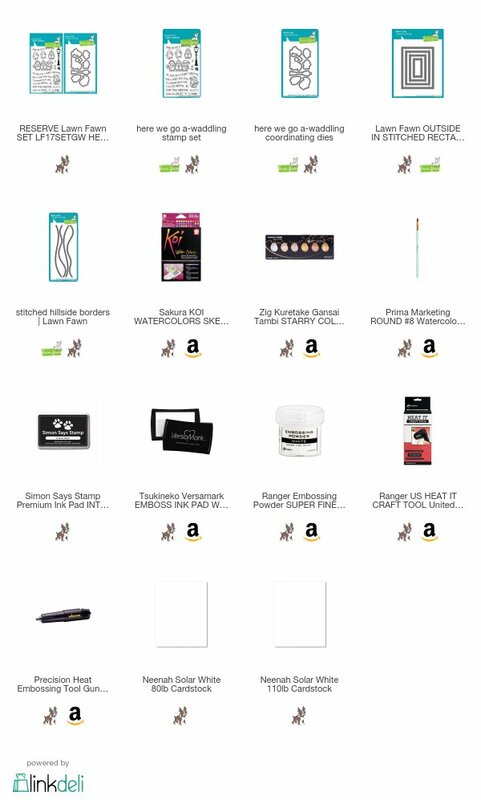 I have been wanting to buy new watercolors and really wanted to know if I should buy Gansai Tambi or Koi! Would love to hear about the differences from you! Really like the background and the shimmers adds a lot! Thanks for sharing. Im really enjoying the cards for 12 days of Chruistmas! They are clean and simple and quick to make. Thanks for sharing. Justine, you really inspire me to watercolor! The lawn fawn carolers are so cute! That background is gorgeous. Love this card. Love these cute little guys... they can sing carols to me anytime. I really like the background idea and the sentiment stamped and embossed on the background like that was perfect. How adorable! Really love this! 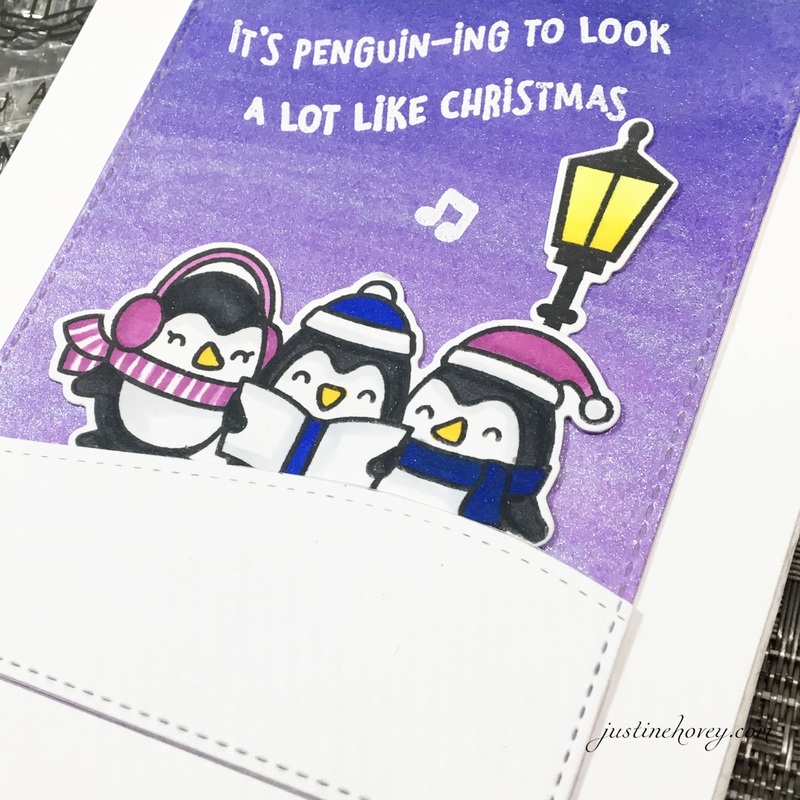 Love your watercolored background, super cute penguin scene! Thanks for another awesome video tutorial - I didn’t know about the varying heat embossing guns. I love these penguins for Christmas this year! They are adorable! Such a cute card..I love LF images and the background sky is great. Those penguins are so stinking adorable! Fantastic background and super cute penguins! Love the watercolor background. The penguins are so cute. Love your 12 days of Christmas. Such a sweet card........well done! Thanks for the tips on Black copics! Using the greys! Super cute penguins love the water coloring so pretty! These penguins are so cute! Lawn Fawn is the best! You make creating a water color background look so easy! Perfect colors for the sweet penguins! Very cute card! The Penguins make me smile! They are so cute and I like the card! Such a fun card and I love the shimmery bacground! I love the penguins. Awesome background too. Thank you for sharing. Cute card and that background is gorgeous! Thanks for your great video!! Adorable card! Love the background too. Thanks for sharing! This card is so adorable. I love the way you made the background with the white gold sheen. It looks great. I'm so stealing that! Thanks for the inspiration!! I bought this stamp set. Can't wait to use it. This is a great idea! Could even change up the background colors to get a different effect. Such a cute card! Lawn Fawn products are always so cute. These are the cutest penguins. I like that you didn’t do it in the traditional green and red scheme. That would have been typical. You made it bright, shiny and fun. Adorable card! Those penguins are so cute and your background is lovely. That watercolor background is beautiful. I love the blue/purple shades. Love all sparkly background. Adorable card. Love the background, always love the cut lawn fawn animals. I absolutely love Lawn Fawn products. They are so much fun. I love the colors you chose. Love Lawn Fawn!!! This card is adorable and the watercolor wash technique is super easy!!! Thanks for your continued inspiration and teaching. Such fun with Lawn Fawn. I love the watercolor background! Penguins are just so darn cute. Love the shimmer that your back put over your background wash.
Love the watercolor background with the caroling (or waddling) penguins. A card that looks as though you spent forever making it, yet you did it so quickly. Thank you for sharing. I like the two types of watercolors - the starry night is such a nice accent. I also appreciate your comments on the two different qualities of the heat guns in your video. It seems so easy watching you... I'll try. Hi Justine, I adore your cards! I love how you make things look so easy to do and they are absolutely wonderful. I now have to get the die, stamps and watercolour set. Thank you for sharing! Lawn Fawn does it again! This is the cutest! Caroling Penguins, I love it! Love that shimmer need to get this set of colors, Penguins super cute. I love the purple.. so cute. The background came out really nice! Another terrific card toady. The penguin stamp is adorable. Love this card beautiful colors & Love lawn fawn stamps. I love this card Justine! The penguins are adorable! Oooooo, I just got this stamp set and I love this card. Will have to get my Koi water colors out and give it a try. Such a cute card. I'm with you as I love penguins too. I think they're just the cutest. What a beautiful background too. Thanks for sharing your creativity! Im fanatic of Lawn Fawn. I love this card! Lawn Fawn has so many cute stamps and dies and these penguins are just adorable! I like the watercolor background too! I just love all of the shine you've given your background! So pretty!!! The penguins are really cute! I love Lawn Fawn, a few local stores where I used to live carried their stamps and dies and I love the few I have! Cute card Justine! Very cute scene with the penguins and I like the fun sentiment and music notes. I LOVE your watercolor background!! I especially like how you added the shimmery watercolor over top!! I have peerless Watercolors, but I just may have to get the 6 pack of shimmery Gansai Tambi colors that you talked about. They add that certain something to the card- like nothing else does. I especially love the penguins-so cute and adorable!! Also, the purple background with the black penguins looks fantastic together!! Beautiful card!! I have the shimmery Tambi's but didn't think to shine the entire background. Thank you for the tip. Your card is so cute, I love the shiny background. What a darling stamp set! Your background looks great. I love that shimmery background. Those colors are awesome. The penguins are so cute! Love the starry colours shimmery background! Amd Lawn Fawn is always so cute! This is such an adorable little Christmas scene ! Adorable penguins and I love the colors. Great job. Those penguins are so cute! And I absolutely love the shimmer on you water colored background. Lawn Fawn stamp sets are so cute, and I love how punny the sentiments that go with them are. Such an adorable stamp set (like most of Lawn Fawn! ), and your card is so cute! Love all the sparkle! I am lucky enough to have a craft store right down the street that carries Lawn Fawn. My version is going to take some creative masking to make it work. You see, I sing 4-part Barbershop Harmony, so I will need 4 singing penguins. Also, Barbarshoppers memorize their music, so I will have to do away with the music book. I think I might take some of that gold shimmer paint you used...this time the really gold color from the six pack & paint that on top of the light to make it sparkle as well. Fun card! It won't let me edit. I mis-typed Barbershoppers. Oops! I really like that you used the notes in the sky, and put the penguin behind the snow bank. Great card idea! I like the colors and the shine in the background. Thanks for sharing. Your watercolor wash for the evening sky is really cool. I haven't attempted that - but you make it look easy. The sparkle wash really is the secret touch. So cute. Adore the here we go a waddling stamps and dies by Lawn Fawn. So cute! This is the cutest card ever, love it. What an awesome giveaway! Thanks. This is so cute, Justine!!! Love it! Adorable! I would love to CASE this for my nephew, he love penguins! I love this stamp set! Great way to use them on that watercolor background. You can never go wrong with Lawn Fawn. So cute. I love Lawn Fawn and this set is just adorable! I just picked up this set this weekend. Thanks for the inspiration!! The watercolor effect is really pretty on these. Hello! Beautiful card! Thank you for sharing. Hugs!